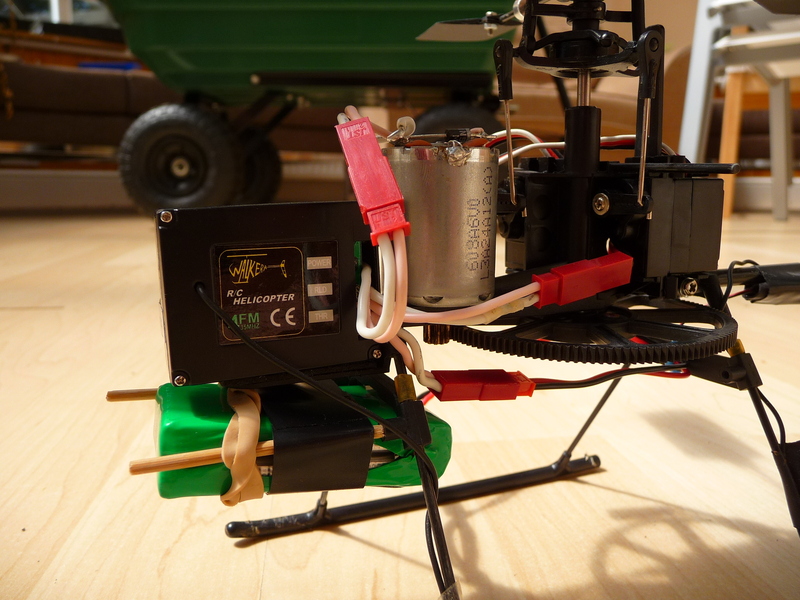 A 2 cell 800mAh LiPo pack is an almost drop-in replacement but the weight is so different that the heli ends up very tail heavy if we put the LiPo underneath the main shaft where the original pack was. The solution is to remove the skid legs by gently sliding the small plastic tube retainers down and pulling the legs out of the main frame. This allows the removal of the front battery rail mounting. Turn that plastic mount around so that the rail holes face forwards. Now we can insert carbon rods or in my case some bamboo food skewers into the holes and use these to support a sling made from electrical tape doubled over which will hold our LiPo. I then put a rubber band around the whole mounting to secure it. I found that the battery needs to be as far forwards as the canopy will allow it but your results may very. You can check the balance of the heli by positioning the flybar at 90degs to the heli body and gently picking the heli up. When you set it down again if the tail touches first, it's tail heavy, if the front of the skids touches first it's nose heavy. Correct balance is vitally important for helis as you need to get as much going in your favour as you can. Any fore/aft error will need you to trim in flight and will pull your heli in the direction of the heavy side as soon as you get off the ground. If you're new to flying this will be a challenge you don't need. Since it can be reduced, if not eliminated, on the ground we must try to get it right.